Body, speech and mind, and the mind is most important. In the mantrayana one says mantras. Mantra means protection of mind, ma means mind and tra means protection. Mantra means protection of the mind from ordinary perceptions. And in the mantrayana you have the 4 tantras: kriyatantra, charyatantra, yogatantra and the highest yogatantra. Kalachakra is included within the highest yogatantra. In the highest yogatantra one has the Kalachakra Tantra and in the mantrayana one has the division into three: there is the basis and the path and the result. So the basis is the being of the practitioner, it's that, what has to be purified. And then that which purifies is the path, and that is the practice of the development stage and the completion stages. And the result of that purification, of that which has to be purified, is the attainment of the state of Vajradhara. One has this basis of path and result, that which has to be purified, and that which purifies, and the result of purification. Generally in the highest yogatantra, the basis which has to be purified is birth and death and the bardo--the intermediate state between death and birth. And that which purifies those is the development stage and the completion stage, these two levels of the path of that which purifies. And through that purification one has the attainment of the result, the state of Vajradhara. In the anuttarayogatantra, in the highest yogatantra, one has this basis, path and result. The basis which has to be purified is the birth, death and bardo. And then the path, which is the path of the development stage and the completion stages, which purifies, then the result which has to be attained, which is the state of Vajradhara. So that is general for the highest yogatantra. Within the highest yogatantra there is the Kalachakra, and the Kalachakra uses different names. That which has to be purified on the basis is called the outer Kalachakra and the inner Kalachakra. The outer Kalachakra is all that which is not the mind of the practitioner. So it's the sun and the stars and so on, so it is all what is outside the individual. That is the outer aspect of that which has to be purified. Then there is that which has to be purified within the individual by the creation of the development stage and the completion stages, and that's the channels, the airs, the bindus within the individual. So that is the inner basis of purification, the inner aspect, that has to be purified. So in the Kalachakra you have this outer and inner Kalachakra, which is the basis of what has to be purified. And the path and the result is found in what's called the other Kalachakra. The other includes the practice of the development stage and the completion stages and the attainment of the state of Vajradhara. So in that way in the Kalachakra one has the outer Kalachakra, the inner Kalachakra and the other Kalachakra. So in the Kalachakra there is the root tantra, the mula tantra, and the condensed or abbreviated tantra, lagho tantra, and also a commentary to the tantras, which is called "The Great Commentary of the Stainless Light," which is to be found in the tangyur, in the Tibetan canon for the translations of commentaries. All these three, the two tantras and the commentary, all of them are presented in terms of five points, five chapters. In these chapters, the outer Kalachakra and the inner Kalachakra form the first two chapters, and then the rest is the other Kalachakra. The first chapter is the outer Kalachakra and that is called the chapter of the world, of the loka. This concerns the orbit and the sun, the moon and the stars in the sky. So it is about the external aspects of what has to be purified. So that is the first chapter, the chapter on the world. The second chapter is called the inner chapter, it concerns what has to be purified within the practitioner of the Kalachakra. Within the practitioner there are the channels or nadis, within there flows the different airs or vajus and there are also the bindus or drops, the white and red bindus. These nadis, vajus and bindus are what has to be purified. One purifies them by the method of the development stage and completion stages. So this inner chapter presents these nadis, vajus and bindus within the individual that has to be purified. That second chapter which deals with the inner aspects of what has to be purified is therefore called the inner chapter. These first chapters deal with the basis which has to be purified: the outer basis that has to be purified and the inner basis that has to be purified. And these two chapters also constitute the outer Kalachakra and the inner Kalachakra. The remaining three chapters deal with what's called the other Kalachakra, which has to do with a path which has to be purified, the development and completion stage and with the attainment of the result. Before one can practice the development and completion phases and attain the result one needs to receive the abisheka, the empowerment. So the third chapter presents the empowerment for Kalachakra, so therefore it's called the empowerment chapter, the abisheka chapter, that's the third chapter of the Kalachakra tantras and the commentary. So in terms of the other Kalachakra, it starts with the third chapter, the chapter on empowerment. The fourth chapter deals with the method for the accomplishment, so it is the chapter on accomplishment, and it basically means the method of sadhana, that means in Tibetan accomplishment, so it's the method of accomplishment. So the method for accomplishment is primarily that of the generation phase. The fourth chapter is presented primarily the method of generation phase and the sadhana, a method of accomplishment, so it's called chapter of accomplishment, the sadhana chapter. The fifth chapter deals primarily with the completion stage. And it's the completion stage practice in which one attains the result, the state of Vajradhara. Therefore, as the chapter deals primarily with the completion stage and the result, it is called the wisdom chapter (jnana chapter). That's the fifth chapter. So you have the five chapters of the tantras and the commentary, the presentation of the outer, inner and other Kalachakra. There is in the five chapters presented the outer Kalachakra, and then there is presented the inner Kalachakra, and then there is presented the other Kalachakra, within those five chapters. In order to do the practice of Kalachakra one needs to receive the empowerment. And so the Dalai Lama gives the empowerment. And he gives it through a colored sand mandala, this is a very elaborate empowerment. So he doesn't give the empowerment on a basis of a painted mandala, of a painted representation of a mandala but through this colored sand mandala. So the Dalai Lama gives the empowerment on the basis of a sand mandala. The reason, the purpose for that is to enable people to do the practice of the generation and completion phases of Kalachakra, which one cannot do without having received that empowerment. To give an exapmle, you have in the different countries the armies. And if you want to join the army then you have to go through examinations and training. They have to check you for illnesses and measure you and see what your body is like, to see whether you will be able to do the military training and be a soldier. So in the same way the empowerment is like an examination, like an entry to see whether you are able to practice the generation and completion phases or not. This provides you with the conditions and circumstances which enable you to practice and train in the generation and completion phases. Receiving the empowerment is like going through different stages to be able to join the army. Then having received the empowerment then one can go on doing the practice of the generation and completion phases. And so this is like having been able to enter into the army. There one undergoes the training in the army. So in the different levels within the army there are the infantry, and the navy and the airforce, so there are all the different levels in the army in which one has to be trained. So in that way one has the different levels in the generation phase and the completion phase. In that way, as there are different trainings in the infantry, in the navy and in the airforce, one has the practice of the generation phase and the completion phase, and so one has within that the meditation on the palace, the divine palace, in which one is a deity. So this is like if you are in the infantry, you go in cars, and if you are in the airforce you travel inside a plane, and in the same way one visualizes oneself within a divine palace. Also one has to train in the use of weapons in order to be able eliminate the enemy, and in that way there is the practice in the generation phase and completion phase. And through having successfully completed one's training, one's military training, then one actually goes against the enemy, and attacks and defeats the enemy, so in the same way through the practice of the generation and completion phase one attains the state of Vajradhara, so that is like having trained in fighting against the enemy and defeating them. So in that way one has the training in the generation phase and the completion phase, in the generation phase one does the visualisation of the divine palace and within that one does the visualization of oneself as having the body of a deity. And so this is like a protection. If it is the infantry, being in tanks so that they cannot be harmed by the enemy, or if you were traveling in planes you have the method to prevent the missiles that have to be fired at them to hit them. So one does this generation phase practice in the divine palace and on oneself as the deity. And then the army which is already in the country, then they have their methods to prevent bombs from coming and so they have their protection, and also they learn how to be able to fire the bombs to hit the enemy. So that is like the practice of the completion phase, so through the completion phase one learns of how to actually hit the enemy with bombs. Applying that example with the army internally, there also exist external armies within the meditation of Kalachakra, within meditating oneself as the deity of Kalachakra. What is primarily meant is the internal armies of the defilements of ignorance and aversion and attachment. So this is the army which the individual has to defeat. So in order to defeat this inner army, then one uses the practices of the development phase and the completion phase, so one has to use all of one's methods, one has to use one's infantry, one has to use one's navy, one has to use one's airforce and send them all against one's inner enemies in order to defeat them. Then also in the Kalachakra teaching there is a presentation of Shambala, so there is an inner Shambala and an external Shambala, just as there is an internal war and an external war. So there is an inner Shambala one has to identify. And this inner Shambala is the means by which one defeats the internal barbarians, the internal army, which are the ignorance and attachment and aversion. And one defeats them by the inner Shambala which means through an understanding of selflessness, through method and wisdom of emptiness. Through the path of method and wisdom one can defeat the inner army of barbarians of the three mind-poisons. For the practice of Kalachakra there is the repetition of the mantra, so Rinpoche asks us to repeat after him the mantra three times, and then, following that, he will give an explanation of the meaning. So in terms of the mantra the first four syllables, OM AH HUM HO, these are the syllables of the vajra body, speech, mind and wisdom. So the OM symbolizes the vajra body, the AH symbolizes the vajra speech, the HUM symbolizes the vajra mind and the HO symbolizes the vajra wisdom. So the first four syllables are symbols of the vajras. The next syllables in the mantra are the HAM and the KSHA, the HAM symbolizes Kalachakra and the KSHA is the consort, Vishvamata. Then the next syllable is MA, which symbolizes the divine palace. The palace itself is a threefold palace, so one palace within another, in the center there is the mind palace, the mind mandala, and around that there is the speech mandala, the palace of the speech mandala, and around that there is the palace of the body mandala, so that is represented by MA. Then next around one can see in the mandala a white circle at the outer edge which is like the water mandala, these principles; there are the four elements, there is also the yellow earth and the red fire and the blue air. These are symbolized by these next four letters. These four are LA VA RA YA, and these four represent the four elements, LA symbolizes the earth, then you have VA which symbolizes the water, then RA which symbolizes the fire and then YA which symbolizes the air. So those four syllables symbolize the four elements. In order to do this purification through Kalachakra, one needs to do practice and one needs to do sadhana. There are different kinds of sadhanas, there are very long ones, medium ones and short ones, so there are different kinds of Kalachakra sadhana. Then in the practice of the Sadhana, one has to visualize the mandala and one has to visualize the palaces. To explain that: we have these palaces, one within each other, so in the innermost there is the mind mandala, then around that there is the speech mandala, and around that there is the body mandala. So in particular in the inner one there is the mind mandala, and one has the meditation on mind mandala, speech mandala and body mandala. The deities included in that are 634, although there are different ways of counting the deities, so there are different numbers, but one way is to say that there are 634 deities in those three mandalas. One can say that in the innermost mandala, in the mind mandala, which is the central mandala, that there are 46 deities. Around that there is the speech mandala, where you have the dakinis of speech or yoginis of speech, and there are 72 of them. Then in the body mandala there are many of the deities. So in one year you have 12 months, and each month has 30 days, so that makes 360 days in each year. So there is a deity for each day of the year, so there are astrological deities, numbered deities, so there are 360 of them in the body mandala. In the Western tradition you have months with 31 days and some with 30 days and so on, months with different numbers of days. In the Tibetan calendar each month has just 30 days. And so in that way one has 360 deities (although Rinpoche 3 times said 364 deities), due to the number of days in a year. These are just the main ones and there are many more deities. So a practitioner meditates on this number of deities. The reason is that for the practitioners, each day of their life, one day made up of a night-time and day-time, that's 24 hours, 12 hours day-time, 12 hours night-time. And in that way it's counted one breath-time, it's one breath in and one breath out, a practitioner has 21,600 breaths every 24 hours. So he needs to purify these successive breaths. And so he purifies these in accordance with the succession of time, with the wheel or cycle of time. So one purifies the breaths, and one purifies internally the channels and bindus and also externally the external elements and the orbits of the sun, and the moon and the stars, which all occur in cycles of time. So that is the meaning, why the practice is called Kalachakra, the cycle of wheel of time. So in counting the breaths, one practitioner has 21,600 breaths a day, and one has to purify each of these successive breaths. And by purifying them, then that cleanses internally the air, which is moving through the body. So they will flow in a straight and gentle way, so that also the channels become straight and smooth and clear, and due to that also externally the elements of earth and water and fire and air are purified. So it is also beneficial for the external world and the society, as well as internally for the body and the mental peace and happiness through the elimination of illness. So for bringing peace and happiness in terms of resolving the conflicts between different religions, which have different views, and also the conflicts between different political systems. That is also pacified through the practice of Kalachakra. So applying to the 10 powerful aspects in the mantra--in the mantra you first have OM AH HUM HO, symbolzing the four vajras. In the design of the ten powerful aspects you then have HUM, and HUM symbolizes the mind, the vajra mind and above that there is a crescent moon. And the crescent moon is the naro which is the sign of the O vowel, so the crescent sun symbolizes this with the circle on top of it, representing the syllable OM, and therefore representing the vajra body. On top of that circle there is the nada, the little flame, that symbolizes the vajra speech, the AH, with the HUM representing the vajra-mind. And then the nada also being a symbol of emptiness, the essence of emptiness, that also symbolizes the vajra-wisdom. While the OM symbolizes the purification of the body to become a vajra-body, AH symbolizes the purification of the speech to become a vajra-speech, HUM the purification of the mind to become a vajra-mind, and the HO symbolizes a subtle aspect of the conciousness that is purified to become the vajra-wisdom. And this is done through the practice of the generation phase and it symbolizes that. The HAM and KSHA symbolize the Kalachakra and Vishvamata, the two main deities in the mandala, and the MA symbolizes the Buddha-palace. These ten powerful aspects are something which is not very easy to be explained, to explain the mantra through that is something very condensed, written in ancient Indian script. And it has these ten parts, these ten letters therefore having these ten different meanings. To do the practice of Kalachakra one needs to have a sadhana, there is the sadhana-chapter in the tantra and commentary, and having received the empowerment from the Dalai Lama, the Dalai Lama will come to Graz to give the empowerment, once you have received that you can practice the sadhana. There is a very brief and condensed sadhana, composed by Ling Rinpoche, the former tutor of the Dalai Lama, which is called the Six Session Guru Yoga. And this is a practice of what is called a Nine Deity Kalachakra. It is called Nine Deity Kalachakra because you have in the center Kalachakra and the consort, they count as one, and then around them on eight places, four in the main directions, four in the intermediate directions, there are the eight shaktis or eight nouma, in Tibetan. So these eight female deities together with Kalachakra and consort make nine. So the Nine Deity practice is very simple, very easy to practice. It is very brief, very simple and easy to practice. There is, larger than that, the practice of the mind mandala, with 46 deities. And so that has been translated into Spanish, probably it exists in English too, but that's difficult to practice and to do. So for the practice of the mind, speech and body mandalas, whether that has been translated into English or not, Rinpoche doesn't know, but that will be a very difficult practice to do. The Nine Deity practice is very simple, it can be done very easily. 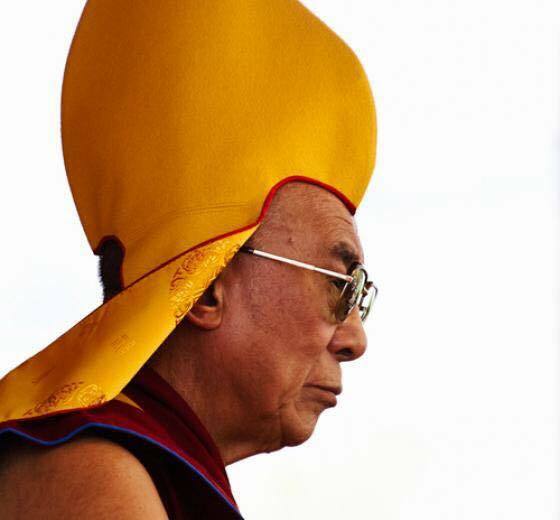 The empowerment by the Dalai Lama, the empowerment is always for the complete practice for the 634 deities, but the Nine Deity practice was translated into English when the Dalai Lama gave the empowerment in Switzerland. That would be easy first to do. Q: War is not a good example to use for Buddhist practice. A: It was used as an example because one has to overcome the inner defilements with forceful means, gentle means will not be able to overcome one's inner defilements. Like for example, if someone is angry and you just say to him "well you shouldn't be angry but better calm down," it will make him even angrier. If one is at a higher level of practice and one can overcome them by gentle means, then one uses gentle means. But a beginner cannot do that, they have to use a forceful method. And for some illness, some can be treated by gentle means, by taking medicines for minor illnesses, but some illnesses are more serious and then you have to have an operation. It's not always needed to have a surgeon cut your body, but sometimes there is no choice, and that's the only way to cure the person. For example if you have a large hospital where everybody is being treated without any need for any operations. For that reason we use the example of war. Q: All these different deities, that is very complicated and it doesn't give a sense of unity. A: That's right in saying everyone is of the same mind, but that people's natures are very different. Some have anger, some don't have anger, some have a lot of attachment, so different methods are needed for different people. Just like you have different medicines, you have something with the eye, you have medicines for the eye; if you have a bad stomach, you take medicines for the stomach. There is not just one medicine for all diseases, you have different medicines for different illnesses. So in that way you have different methods for different people. For example you have dentists if there is something wrong with your teeth, you have psychiatrists to cure the illnesses of mind. You have different kinds of doctors, different kinds of treatment, not just one kind of doctor for everything, so therefore they have also different kinds of medical training, so you have all these different kinds of things, not just one. In the same way in education, you have university-teachers, middle-level-teachers, different teachers for different classes. So you don't have just one teacher for everybody and everything. The OM AH HUM HO, the vajra body, speech, mind and wisdom. So for practitioners that's for purifying their body, so that it becomes a vajra body, purifying their speech it becomes vajra speech, purifying their mind becomes vajra mind. And there is a very subtle form of consciousness you have in the five aggregates, aggregate of consciousness, there is an obvious one and a subtle one, so purifying the subtle one, that recreates the vajra wisdom. So these are the seed syllables of these four. On top of that (namchuwangdan) you see a white crescent moon and then a red disc which is the sun and on top of that there is a flame. So those count as three things. Below that there are just seven syllables. The HAM KSHA MA LA VA RA YA. But those three aspects plus the seven make together the ten powerful aspects. On the side you see the colors, each letter is a particular color, starting with HAM which is black or dark blue, and then is KSHA which is green, and then there is a multicolored square which is to be MA, and then there is the yellow LA, and VA is white, RA is red and YA is blue or black. Included within this there are symbols of that which has to be purified, the external world that has to be purified, the internal beings which have to be purified, and also the method of purification like the palace and the practice of the perfection stage and the development stage. The development stage is symbolized by the circle on top for example, so the elements that have to be purified are also symbolized among these seven letters and these three symbols. So today is the explanation of how the Kalachakra Tantra was first taught, how it was taught and how it was transmitted in Shambala and then how it was transmitted from Shambala to India. And then how it spread from India through Tibet. So that's what He will talk about today. Buddha was born in India. Until he was 28 he was a prince, then he left home, and then for 6 years he had hardships and at the age of 34 he achieved Buddhahood in Bodhgaya. When he achieved Buddhahood he went to Varanasi to turn the wheel of the Dharma, and after that he went south to the Dhanyakataka to teach the Kalachakra tantra. 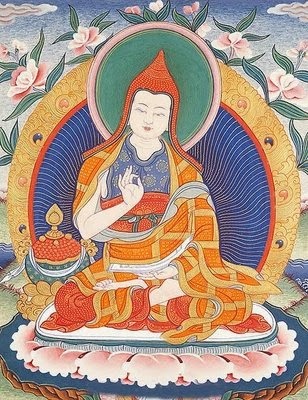 At the same time when he was 36 years teaching at Vulture Peak mountain the Perfection of Wisdom Sutras, and the same time in the south at the Dhanyakataka he manifested as the Kalachakra and taught the Kalachakra Tantra in particular to the king of Shambala, who was there accompanied by 96 minor kings, who came with him from Shambala. At the same time as Shakyamuni Buddha was teaching the Prajnaparamita at Vulture Peak mountain, he emanated in the south at the Dhanyakataka stupa where he manifested 11 mandalas above the stupa, and below that the mandalas of the body, speech and mind of Kalachakra. So the 11 mandalas were made of mandalas of Chakrasamvara and Guyasamaja and so on. So then he taught the Kalachakra Tantra to the King of Shambala, principally to him and to his 96 minor kings of Shambala. This is now Drepung monastery. The king Suchandra was an emanation of Vajrapani, and a 10th level Bodhisattva, and the lesser kings were emanations of Avalokiteshvara or Manjushri. So these emanations received once the Kalachakra tantra. And King Suchandra took the text, the root tantra of Kalachakra, with him to Shambala. So this teaching did not exist in India, it was taken to Shambala, where he composed a commentary on it. And then this was passed on through his sons. There were 6 kings of Shambala, each reigning 100 years and each one passing on the teachings and instructions of Kalachakra. So after Suchandra there were 600 years of the transmission of Kalachakra through these Shambala kings. King Suchandra went back to Shambala and there he taught the root tantra, and there he built the Kalachakra Palace, so he did this and it took three years to do that and later on he passed away. And after him there was a succession of 6 Dharma kings, so then 600 years passed. And then you have the first of the Kalkin kings or Rigden kings. The first one was called Manjushrikirti (Manjuyashas) and for his reign of 100 years he taught the Kalachakra Tantra to many people. And they said because the root tantra taught by the Buddha was so vast and so difficult, could you abbreviate it. Manjushrikirti, the first Kalkin, composed the text, which was called the Laghu tantra or Summarized Tantra of Kalachakra from the very large root tantra, which was taught by the Buddha. The succession of 25 kings of the Kalkin dynasty. Manjushrikirti was the first of these 25 of Kalkin kings and then his son, Pundarika, composed a vast commentary to the condensed tantra. And it is only this condensed tantra which was spread into India and then to Tibet. So the condensed tantra is now in the kangyur, in the canon, of Tibet, but not the original root tantra, that was not introduced into India and Tibet. Pundarika's commentary to that is called Vimalaprabha (Stainless Light), and that exists in Tibet in the kangyur, in the collection of commentaries. Manjushrikirti, the first of the Kalkin kings was an emanation of Manjushri, and his son Pundarika, who wrote the commentary was an emanation of Avalokiteshvara. In the root tantra of the Buddha there is a prophecy about the actual composition of the condensed tantra and the commentary. The Buddha says to Manjushri and all the bdhisattvas that after 600 years, you, Manjushri, will summarize the tantra and create a condensed version. And then after that Avalokiteshvara will compose a commentary to it. So the creation of the (condensed) root tantra and the commentrary by Manjushrikirti and Pundarika was prophesized by the Buddha in the root tantra. So that of the the first dynasty, the earlier translation in the west where Kulika was and now is Kalkin, is the correct version. Manjushri and Avalokiteshvara created this summarized tantra and the commentary. In Tibet the Panchen Lama is an emanation of Manjushri, and the Dalai Lama is an emanation of Avalokiteshvara. So in that way, They give the initiation of Kalachakra many times because in this way They have that strong connection with Shambala, with Manjushrikirti and Pundarika, a connection with Shambala and Kalachakra and the Kalkins. So therefore they give the empowerment a lot. Q: But isn't the Panchen Lama Amitabha ? A: They are of the same lotus family. 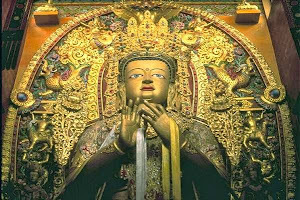 The Panchen Lama is also a rebirth of Guru Rinpoche and of Atisha. And the Dalai Lama is like a rebirth of Atishas main disciple Dromton, so they have these Guru-pupil relationship. Atisha is considered like an emanation of Amitabha. In the root tantra the Buddha prophesized that after 600 years there will be the creation of the condensed tantra and the commentary. And then he also prophesized that there will actually come these external barbarians, who have their teacher called Madhu-Mati, and that they come from Mecca in Saudi Arabia. So you have internal barbarians and external barbarians and these are the external barbarians, who's teacher is born in Mecca, so this was prophesized in the root tantra. In the tantra and the commentaries it explains about this religion. So it is prophesized in the tantras that there will be disharmony, conflict between the Dharma and the barbarian religion, because in the barbarian religion it is a religious duty to kill and in the Buddha's teaching it is said that you should avoid harming beings, so therefore they contradict. It is prophesized in the tantra. In order to overcome this conflict, there is the practice of the Kalachakra, this is very efficent in overcoming conflicts and creating peace and happiness. So the Kalachakra was taught in Shambala and preserved in Shambala and it was not introduced into India until much later times. So for example, it is said that the Buddha's teaching has been in this world for about 2800 years but the Kalachakra teaching has only been available for 903 years. The way in which the Kalachakra was introduced from Shambala into India is that there was a pandita Chilupa, born in Orissa, south of India. And there he read that there was the Kalachakra teaching, which was not available within India and Tibet but only in Shambala. So he thought that he had to go to Shambala to get this teaching. And so he set off and he got into a ship to go off to Shambala. An emanation of the Kalkin king of that time, also an emanation of Manjushri appeared to him asking him where he wanted to go. And he said that he wanted to go to Shambala, and the Kalkin said that it is not possible for him to go to Shambala and that he will never get there. But he asked why he wanted to go there. So Chilupa answered that he wanted to go there to get the Kalachakra teachings. The Kalkin said that if he wants to have the Kalachakra teachings, he can give it to him. So this emanation gave Chilupa the whole tantra and the empowerment and the instructions. And then Chilupa went to Nalanda monastery, of which only the ruins are left now, and they had a pupil called Nalandapada, the bodhisattva Nalandapada, who received all the empowerments and instructions. And then he wrote up above an entrance way from the Vimalaprabha, the commentary to the Kalachakra, which said that in order to understand the Kalachakra you first have to understand the Manjushri-Namasamghiti, it is a text of praise of the names of Manjushri, and then you can understand Kalachakra. If you don't understand that, then you don't understand Kalachakra. And there were 500 panditas and scholars debating with Nalandapada about this, and he defeated them all in the debates on the subject on Kalachakra. That spread the fame of Kalachakra through India. What he wrote above the entrance were the ten powerful aspects and the mantra of Kalachakra, and beneath that he wrote that in order to understand that you have to understand the Manjushri-Namasamghiti, the tantra which is the praise of the names of Manjushri, which is in the canon. 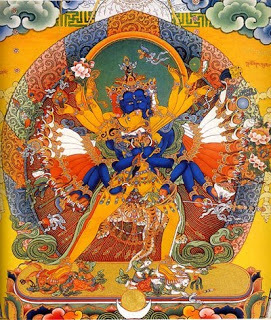 If you don't understand Manjushri-Namasamghiti you won't understand the Kalachakra Tantra.